WASHINGTON (April 23, 2010) -- Two dozen Soldiers, Sailors, Airmen and Marines became citizens of the United States, April 23, during a naturalization ceremony at the White House. The event was hosted by President Barack Obama. 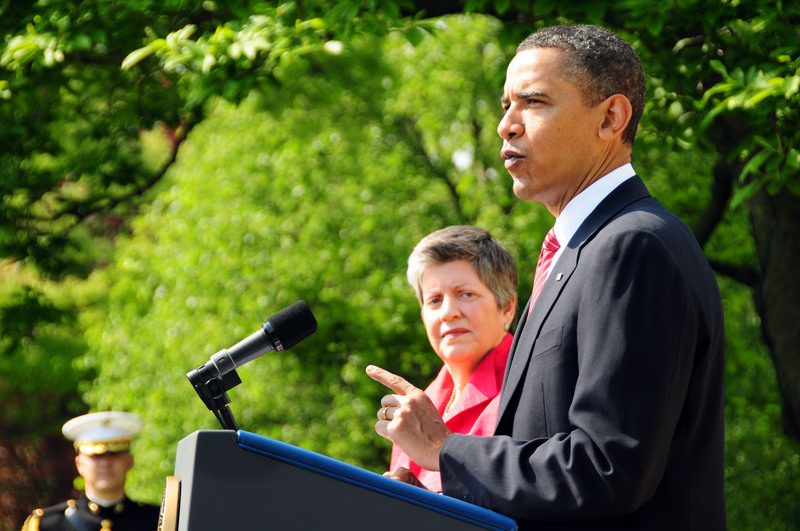 The president was joined by Secretary of Homeland Security Janet Napolitano, and Alejandro Mayorkas, director, U.S. Citizenship and Immigration Services. 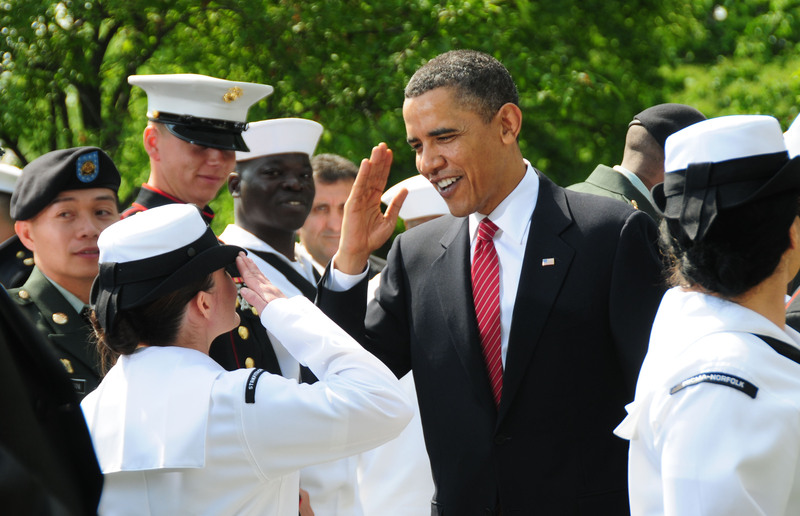 President Barack Obama salutes a Sailor following naturalization ceremony, April 23, at the White House. During the ceremony, 24 U.S. servicemembers took the oath of allegiance to the United States, becoming American citizens in the process. The servicemembers hailed from nations such as Brazil, China, Colombia, England, Ethiopia, Guyana, Haiti, Jamaica, Kenya, Mexico, Papua New Guinea, Peru, the Philippines, Poland, Togo, Trinidad and Tobago. "It is a great honor to serve as your commander in chief and it is my greatest pleasure to be among the first to greet you as a fellow American," said Obama, following the oath of citizenship. "Some of you came to America as children, holding tight to your parents' hands as you arrived in a new world," he said. "Some of you came as adults, leaving everything you knew behind as you pursued a new life. While your stories are your own, today, we celebrate the common spirit that lives within each of you -- the spirit that has renewed and strengthened America for more than two centuries." The president told the new Americans -- each already serving the nation as members of the armed forces -- that being a citizen comes with responsibilities. "Citizenship is not just a collection of rights, but it is also a set of responsibilities," he said. "Like so many others, these men and women met their responsibilities, they have earned their citizenship." Since Sept. 11, 2001, the U.S. has naturalized over 58,000 members of the armed forces, Napolitano said. "It takes a very special individual to serve and defend a nation that is not yet your own, but that is what each of you are doing, that is testimony to your strong sense of patriotism," she said. Included among those who became U.S. citizens were: Pfc. Andrew Hopeton Smith, 400th Military Police Battalion, Fort Meade, Md. ; Spc. James Nyaga Muchoki, 634th Battle Support Group, Springfield, Ill.; and Pfc. Michael Z. Armstrong, 450th Civil Affairs Battalion (Airborne). "It means a lot to me -- I believe in freedom," said Smith, on becoming a citizen. "There's no better way to go if you live in this country -- I love this country. I want to be a citizen." Hailing from Jamaica, Smith has been in the U.S. for eight years. He says it was the professionalism of the Army that drew him in. Muchoki, who is originally from Kenya, said he originally served in the U.S. Air Force, but was attracted to the Army because it offered him the option to serve as an x-ray technician. He said he's been in the U.S. since 1992, and chose to pursue citizenship after getting a family and "finally settling down." "It's a very exciting day, finally, it feels like it was the last thing I needed to do," he said. Armstrong, originally from England, has been in the U.S. for six years now. His father is a member of the U.S. Air Force. He said he joined the Army "to try something new," and says meeting the president and getting citizenship was an important moment in his life. 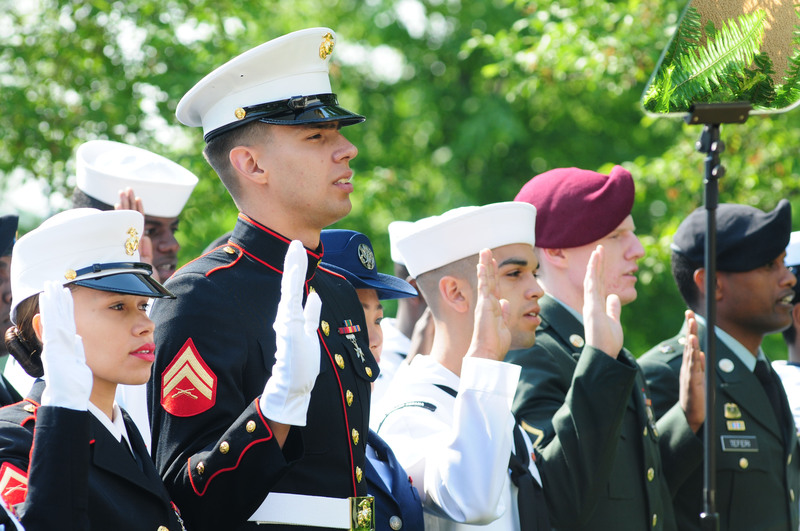 Soldiers, Sailors, Airmen and Marines raise their hands and swear allegiance to the United States during a naturalization ceremony, April 23, at the White House. "It was brilliant, one of the most memorable moments in my life, actually," he said. Following the naturalization ceremony, the president asked Marine Corps Sgt. Ledum D. Ndaanee to come forward. Ndaanee was presented with the "Outstanding American by Choice" award. The award highlights the importance of citizenship rights and responsibilities through recognition of the outstanding achievements of naturalized U.S. citizens. Ndaanee, originally from Nigeria, joined the Marine Corps in 2004, and became an American citizen in 2007. President Barack Obama speaks during a naturalization ceremony, April 23, at the White House. During the ceremony, 24 servicemembers took the oath of allegiance to the United States, becoming American citizens in the process.